I do not think this needs a lot of explaining. If you were in front of your television for Super Bowl 49 and you decided to not go to the bathroom for halftime then you saw Katy Perry put on a larger than life show riding a giant golden animatronic lion. If you did go to the bathroom I have conveniently embedded the Youtube video for you. That large animatronic lion was walkething about on your tv screen for you and an audience of 114,400,000 of your closest friends. The glowing red eyes were a nice touch. If you feel this was wholesome family entertainment then be my guest. If you feel you just witnessed the ritual of rituals I don’t blame you. I am simply presenting the correlation to 1 Peter 5:8. Just in case you didn’t consider that you may have just witnessed prophecy fulfilled in the year 2015. But Wait There’s More. Disclaimer. This is the Red Pill. So I thought I was done analyzing this performance. I thought the biblical reference was good enough. But I have unearthed some more things about the Katy Perry Super Bowl 49 Halftime Show. Full disclosure. I was not the first to discover this. 114,400,000+ people watched this performance on tv. I came across something in reading the Book of Thoth. I Googled this theory to see how many people mentioned this on the world wide web before me. ONE person mentioned it. Now there are two. This is the monumental ground we have to cover as a society to truly understand the current pop culture landscape. A deeper understanding of the symbolism in the Katy Perry Super Bowl ritual is found in the works of a man named Aleister Crowley. There existed a man in the early 20th century named Aleister Crowley. If you are an avid reader of conspiracy blogs and websites then you have likely heard of him. The problem is you have probably never sat down and read his works. I certainly don’t blame you. His writings are incredibly challenging to read. But if you want to understand Katy Perry and her rise to superstardom then someone has to read Crowley’s works. I did. Crowley wrote many many occult books and he is tremendously influential in the world today. That is the sobering reality of the situation. He invented his own religion called the Thelema which I would best describe as Alchemy meets Qabalah. Some of his most popular books include The Book of the Law, The Book of Lies and The Equinox of the Gods. Between these major Crowley works you are going to find an overwhelming treasure chest of occult symbolism, concepts, philosophy, magick and rituals. There is another book by Aleister that I want to draw your attention to. This is The Book of Thoth. The Book of Thoth explains in-depth the meaning of tarot cards (specifically the Thoth Tarot Cards which Aleister created). 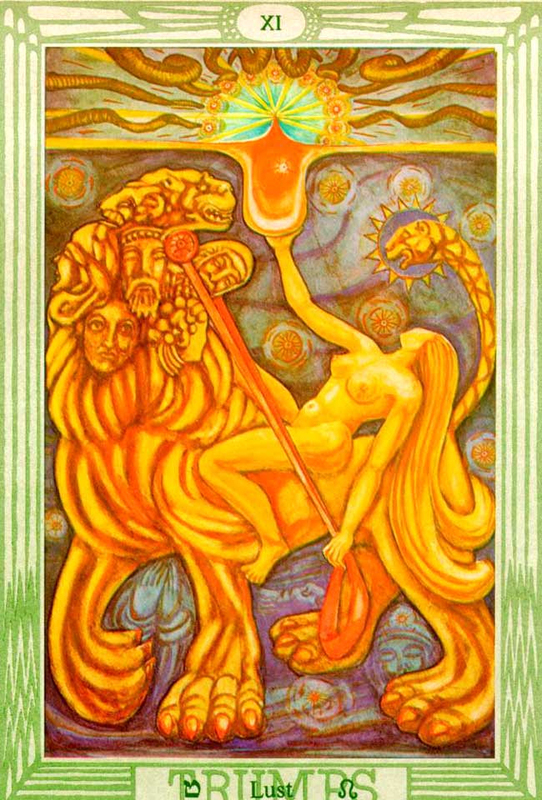 The Thoth Tarot Card Deck is kind of like flashcards for concepts found in The Book of Thoth. The Book of Thoth and The Book of the Law go hand in hand. The Book of the Law is directly referenced many many times in The Book of Thoth by Aleister. You want more? Aleister Crowley LOVED chess. Seen any human chess boards lately? You are being promoted Aleister Crowley and the Thelema religion on a spectacularly grandiose scale by Katy Perry and other very powerful celebrities. The Thelema religion is being jammed down your throat. In upcoming blog posts I will examine the Thelema religion in more detail. We will study Katy Perry further. And we will examine many other artists and current events to see what they are promoting to us.